"A person is smart. People are dumb, panicky, dangerous animals and you know it. Fifteen hundred years ago, everybody 'knew' the earth was the center of the universe. Five hundred years ago, everybody 'knew' the earth was flat, and 15 minutes ago you 'knew' that people were alone on this planet. Imagine what you'll 'know' tomorrow." An amalgamation of several film genres, the original Men in Black is that rare, shining example of a movie that perfectly synchronizes its complex gears. As sleek as a Mercedes yet possessing the power of a Porsche, Barry Sonnenfeld's imaginative film continues to entertain over repeated viewings, thanks to a witty, tongue-in-cheek screenplay, delightfully creative special effects, and classic chemistry between stars Tommy Lee Jones and Will Smith. Running on all cylinders for most of its 97 minutes, the film seamlessly integrates elements of sci-fi, action, comedy, monster and buddy movies without short-changing any of them. Many films try to be all things to all people and end up being nothing to anyone, but MIB brilliantly succeeds on all counts. And with a spanking new, razor sharp Superbit transfer and room-shaking DTS audio track, Men in Black deserves to be revisited over and over again. If you don't know the plot by now, you've probably been hibernating for the past six years in another galaxy. In a nutshell, Agent K (Jones) works for a top-secret organization that monitors and supervises the thousands of aliens that inhabit our planet and roam about unrecognized. When his aged partner retires, K seeks a replacement and settles on street-wise cop James Edwards (Smith), whose disdain for authority and cocky attitude make him a tough nut for the by-the-book K to crack. When an alien invader inhabits the body of a redneck farmer (Vincent D'Onofrio) and seeks to destroy the delicate earthly balance�as well as Earth itself�K and new sidekick J are called upon to, for lack of a better clich�, save the world. 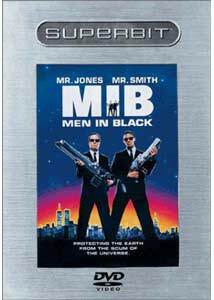 Based on the Malibu comic by Lowell Cunningham, Men in Black differs from other comic-to-movie treatments like X-Men and Spider-Man in that it never takes itself seriously. The innovative and effective opening title sequence, which follows a juicy bug as it travels through the countryside until it jarringly splatters itself on a car windshield, at once sets the film's light-hearted tone, and from there the filmmakers carefully craft each episode to milk as much comedy as possible from the material. Every element�character, dialogue, situation, special effect�is constantly in play, yet the amusing results never seem labored or forced. Even the outlandish aliens fit so snugly into the world created by Sonnenfeld and screenwriter Ed Solomon that one almost begins to believe such a world might aptly represent our current reality. The way Men in Black subtly sneaks such nuggets of substance into its blockbuster framework is just another example of the film's potent creativity. Jones' dead-on deadpan portrayal contrasts beautifully with Smith's high-energy antics. Both make the most of every comedic opportunity, and while Jones keeps MIB grounded and centered, Smith quietly steals the film with animated line-readings and facial reactions. Watching the two play off each other is even more fun than seeing them liquefy aliens with an arsenal of gleaming chrome gadgetry. Rip Torn grabs his share of laughs as the MIB head honcho and Linda Fiorentino lends the film some quirky sexiness as a medical examiner who finds the dead far more fascinating than the living. While Men in Black thumbs its nose at weighty messages, it does cleverly convey that we humans possess a bloated view of our own importance. The film makes the point that, in the grand scheme of things, we really are mere specks of dust in our vast, mysterious universe�a universe we can only hope is as imaginative and entertaining as the one Sonnenfeld and company have created. Image Transfer Review: Columbia has done a stellar job fashioning the MIB Superbit transfer. The image is so crisp and clean, at times it looks like true high definition. Every pore and crevice on Jones' weathered face is rendered in terrific detail, while all the alien slime and goo is appropriately vivid and vibrant. While some viewers question the superiority of the Superbit format, the evidence here is clear-cut. When comparing the Superbit MIB to Columbia's original release, the Superbit transfer is noticeably brighter and crisper, as if a thin veil of haze has been lifted from the image. Many key scenes transpire at night, so black level is especially important. The Superbit DVD shines in this respect, with true, rich blacks and excellent shadow delineation. Lines are sharp but not, to my eye, enhanced, and colors are deep and lush, beautifully spotlighting Smith's pre-MIB wardrobe. Men in Black fans will definitely notice the differences that make this transfer worth owning. Audio Transfer Review: Two audio options are available�the Dolby Digital 5.1 track (included on the original release) and a new DTS track only available here. Not surprisingly, the DTS track wins hands down. It's not just louder, it's more detailed, nicely capturing many subtleties that the DD track misses. Dialogue nuances are more audible, background noise more discernible, and the woofer rocks the room. While the DD track certainly makes the grade, the DTS audio just pumps everything up an extra degree, including Danny Elfman's terrific score, making the film more enveloping and entertaining. Once again, if you're a real MIB nut, the DTS option is a must-have. Extras Review: Typical of the Superbit line, no extras are included, as disc space is designated solely for audio and video quality. I'm already a fan of Men in Black, but the Superbit version made me want to watch it again immediately. The extras on the original release are fun and informative, so I guess I'll have to keep it lying around, but from now on, I will only watch the Superbit version with DTS. The enhancements make a great film that much more enjoyable. Highly recommended.